Bodies and machines are defined by function: as long as they operate correctly, they remain imperceptible; they become a part of the process of perception, as the extension of the action that engages the Self with the world. In a world defined by efficiency, the infallible performance of bodies and systems is often taken for granted. So, what happens when failure occurs? Then the transparency (of the body, of the object) is being removed and we can finally see and sense what it actually is. A broken pencil goes back to being wood and lead –rather than a tool that inscribes our thoughts on paper; a crashed computer becomes arrays of code, software and coloured light on the screen, rather than an interface that imitates reality. The true nature of the machine –and the wilderness hidden underneath the orderly surface- suddenly makes itself evident through a glitch. A glitch is a rupture in information flow, which forces the digital file out of its flawless hyperrealistic design to a reality of randomness and imperfection. The glitch forms part of our everyday experience of broken files, white noise in videos, audio distortions, or the occasional “Blue Screen of Death” of the Windows. A minor error obstructs the processing of data, failing to convert them to an understandable form; it is a flash of reality, disclosing the mechanical processes and mathematical codes that constitute digital information. Behind the façade of the screen there is a complex structure that goes into unperceivable depths; it is a fascinating encounter with alternative possibilities of information procession, a rebellion against the limiting dictate of anticipated use. However, the potential is always there, even before error occurs. Gilles Deleuze accepted the virtual as something fully real, as the basis for the production of actual experience. Within the virtual exist all the possible forms it can acquire, all the possible meanings it can represent; therefore, error, as one of these possibilities, constitutes a part of virtuality. The machine holds within it a potential for the glitch, with the possibility to generate unforeseen results. Therefore, “malfunction and failure are not signs of improper production. On the contrary, they indicate the active production of the ‘accidental potential’ in any product”, as Paul Virilio noted. Accepting error as something inherent in the machine brings us to the original meaning of the word error: a wandering in a different path, without a purpose, that can give unexpected results. In Greek, lathos originally meant something that remains hidden and imperceptible. The error reflects a lack of efficiency, but not a lack of meaning -the meaning is there, lanthanon (hidden). The potential in the machine, the wandering from the objective, the unexpected twists become fascinating elements within the realm of Glitch Art. In order to understand Glitch Art, one needs to bear in mind that it is part of a long artistic tradition, that begins with Modernism, Abstract Art, Dada, Happenings and Conceptual Art, and is closely linked to DJ culture, remix and hacking. Error, chance and serendipity have delimited a field of experimentation for 20th and 21st century artists. Modernist artists refused to disguise art into a mirror of the world or a window to another dimension and preferred to present it as it was: a painting was not a representation, but rather paint on the canvas. In a similar way, the glitch strips the digital file from its representational qualities and reveals it as it is: strings of code that are translated into a form through software. Duchamp sought ready-made objects to create his art; likewise, contemporary artists are not interested in producing something new, but seek to highlight and transform something that already exists (a crashed system, a deficient file). Pollock’s canvases came to being as an intersection of the artistic gesture with the force of gravity and chance; in databending glitch art, the work comes forth as a result of the “reaction” of the machine to a deliberately altered program. The artistic explorations of the void –for example, John Cage’s 4’33’’, Robert Rauschenberg’s White Canvases and Yves Klein’s exhibition The void- simply provided the frame where creation took place, which can be understood as a virtuality that took shape from the noises, the shadows and the movements of the people who were present; glitch art also leaves the work open to intervention by the public. The notion of glitch is also present in other realms of contemporary culture, where the reuse and remix of existing elements into something new is fundamental. From John Cage’s prepared piano to Grand Wizard Theodore’s scratching and the latest releases in electronic music, scratching and sampling, as well as incorporating intentional or accidental noises have become mainstream practices. In short, the aesthetics of error have been a driving force in modernist and contemporary culture. Glitch artists employ diverse approaches to the questions of randomness and error: they look for errors within systems and project them, they hack systems and transform them so as to produce distortions or create the frame where random deviations will take place. The artist duo JODI were among the first who incorporated glitches and machine malfunctions into their digital art, questioning our control over technology. “404.jodi.org” (1997) is a series of pages, where users can type text messages and see the text submissions of the previous visitors. However, the texts undergo distortion filters, before they appear on the page, creating a confusing sum of false messages. The work is an ironic remark on the commonly occurring 404 Error, appearing when the server cannot find the information requested. The categorization of the error expresses a need to explain the failure of function, an attempt to define and control the endless possibilities of virtuality, before it becomes actual. Despite the attempt to control, errors are not always detected and analysed by the machine. And this is where the user steps in: “report a problem” is a recurring exhortation on the Internet, in a futile attempt to eliminate any possible error. 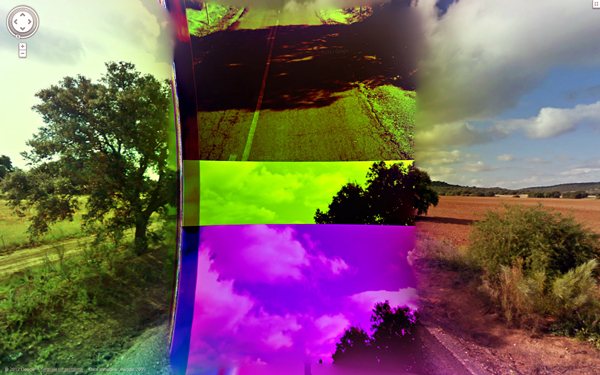 Emilio Vavarella travels on Google Street View searching for distorted images, before they are reported and substituted by “correct” ones. “Report a Problem”, part of his “Google Trilogy” (2012), expresses “the relationship between humans, power and technological errors” as a collection of “wrong landscapes”. These images reflect the vision of the machine onto the real world, colourful and uncanny, and express endless possibilities for the perception of our surroundings. Rather than searching for ruptures in systems, artists like Nick Briz provoke them deliberately through databending –disrupting the flow of information intentionally by distorting a file or software. The video “Binary Quotes” (2008) is “giving away the computer's secrets by reading its 'binary code' and so the computer is trying to do everything it can to defend itself”, as the artist states. Briz altered the binary code of the video, resulting in multiple video and audio distortions. As the initial video distances itself from the imitation of reality, the pixels and sounds that constitute it acquire an autonomous aesthetic quality for what they are, not for what they are supposed to represent. Built with the aid of random and deliberate glitches Rosa Menkman’s “The Collapse of PAL” (2010) contemplates on the obsolescence of the PAL signal, due to its substitution with digital technologies. Menkman is an artist that experiments with diverse techniques in glitch art –broken devices, data compression, video and image bending- and a theorist that avidly documents the evolution of the movement. In this work, one can perceive both sides: Menkman makes a comment on the subject of obsolescence and the difficulty to reproduce old archives, as technologies perish. At the same time, she creates a succession of haunting videos and noises, distorted and mesmerizing. From the examples above, it appears that glitch art is not simply dictated by formalist criteria; on the contrary, it follows closely the ideas that relate to the Information Age. Glitch art challenges the concept of authorship, as it is based on appropriated errors or intervention in systems; moreover, it goes against programmed obsolescence, as it suggests an alternative use of digital devices that expands their life span. During this process, it defies existing restrictions regarding patents and copyrights and defends the right to unlimited access to information. In this sense, glitch is also linked to piracy and hacking, because it deals with entering a system and changing its properties, disregarding restrictions in information flow. The glitch signifies a deviation from the intended use of the system, but it is not a misstep; rather it is a pretext for experimenting with the expressive, creative and functional qualities of the machine and exploring the endless virtuality kept within. Maurice Merleau-Ponty, Phenomenology of Perception, New York: Routledge, 2005 (1945), p.239. Mark Nunes, “Error, Noise and Potential: The Outside of Purpose”, in: Mark Nunes (ed. ), Error: Glitch, Noise and Jam in New Media Cultures, New York: Continuum, 2010, pp.3-23. Sylvere Lotringer and Paul Virilio, The Accident of Art, Semiotext(e): New York, 2005. p. 2. Nicolas Bourriaud, Postproduction, Culture as Screenplay: How Art Reprograms the World, New York: Lukas & Sternberg, 2002, 17. Rosa Menkman, The Glitch Moment(um), Institute Of Network Cultures, 2011. Emilio Vavarella, "The Google Trilogy", Interartive #50, Special Issue: Art and Copyright, March 2013. Grammatikopoulou, Christina (2013), ‘Hacking: A New Political and Cultural Practice’, Aceti, Lanfranco; Rinehart, Richard (eds. ), Not Here Not There, Leonardo Electronic Almanac, Vol.19, Issue 1.